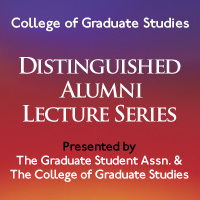 In an on-going effort to provide career development to students in the College of Graduate Studies, the Distinguished Alumni Lecture was created. The day-long event includes a one hour seminar to help mentor our graduate students in the area of career development, lunch with graduate students, and several meetings with our faculty. Dr. Noujaim earned his PhD from the Pharmacology Program in 2007. His dissertation advisor was Dr. Jose Jalife. 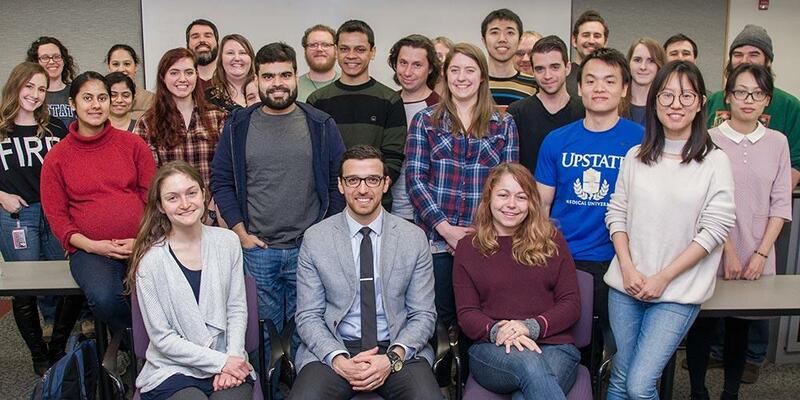 Dr. Sami Noujaim, 2018 Distinguished Alumni lecturer, meets with students in the College of Graduate Studies. April 12, 2010 - The first annual Distinguished Alumni lecture was presented by Dr. Carlo Nalin, Executive Director of the Novartis Oncology Division of Novartis Pharmaceutical Corporation. Dr. Nalin earned his Ph.D. in 1982 in our Biochemistry and Molecular Biology Program. His thesis sponsor was Dr. Richard Cross. April 29, 2011 - Dr. Kip West, Lead Senior Scientist at Infinity Pharmaceuticals. Dr. West earned his PhD in 2001 from our Anatomy and Cell Biology Program. His thesis advisor was Dr. Christopher Turner. May 15, 2012 - Dr. Paul Cheney, Professor and Chair of the Department of Molecular and Integrative Physiology at the University of Kansas Medical Center. Dr. Cheney earned his Ph.D. degree in 1975 in our Physiology Program. His thesis sponsor was the late Dr. James Preston..
March 15, 2013 - Dr. Matthew Bonaparte, Scientist at Sanofi Pasteur. Dr. Bonaparte earned his PhD in 2005 from our Microbiology and Immunology Program. His dissertation sponsor was Dr. Edward Barker. February 11, 2014 - Dr. Jack (Matt) Webster, Senior Scientist, Project Director of the Diagnostics and Biomedical Technologies at GE Global Research. Dr. Webster earned his PhD Degree in 2004 from our Pharmacology Program. His dissertation sponsor was Dr. Richard Wojcikiewicz. April 20, 2015 - Karlett J. Parra, Ph.D., Associate Professor and Chair of the Department of Biochemistry and Molecular Biology at the University of New Mexico. Dr. Parra earned her PhD from the Biochemistry and Molecular Biology Program in 1998. Her thesis sponsor was Dr. Patricia Kane. February 24, 2016 - Mary Fowkes, MD, PhD, Director of Neuropathology and Autopsy Service, Associate Professor of Pathology, Icahn School of Medicine at Mount Sinai. Dr. Fowkes earned her PhD from the Anatomy and Cell Biology Program in 1999. Her thesis sponsor was Dr. David Mitchell. February 7, 2017 - Georgia Tomaras, PhD, Professor of Surgery, Immunology, and Molecular Genetics and Microbiology, at Duke University Medical Center. Dr. Tomaras earned her PhD from the Microbiology and Immunology Program in 1998. Her thesis sponsor was Dr. Steven Taffet. Last Modified: February 23, 2018. Contact Jennifer Plencner with questions about the content of this page.